This guide will explore sections A-E of the Course Quality Criteria. Learning outcomes are statements that describe what students will be able to do by the end of your course. Learning outcomes start with: "By the end of this course, students will be able to...", followed by a verb related to the desired action or performance and ending with the object of the statement. They should drive the design of all course content and activities. For a list of verbs, we recommend Googling Bloom's Taxonomy verbs (and focusing on the higher-order thinking levels like creating, evaluating and analysing). Because at the end of your course, your culminating learning activity (or course project) should measure how well students were able to achieve the learning outcomes. Murky verbs aren't easy to measure! 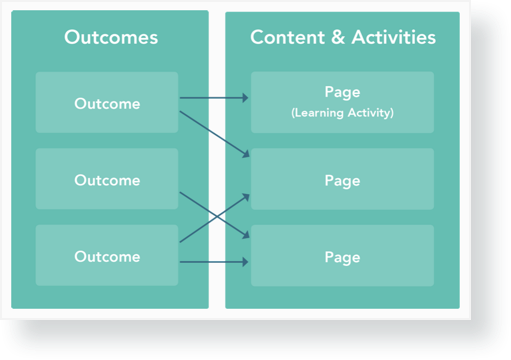 In OpenLearning, you can set up outcomes as well as outcome tags. Outcome tags are shortened versions of the outcomes. Add them to pages throughout the course to reflect alignment between learning activities and outcomes. (i.e. what you're learning about on a page relates to a learning outcome). Outcome tags are also necessary when using the assessment system.